If the labour law and industrial relations community are to retain expertise and social utility in their vital role, constant monitoring of the field and discussion is essential. 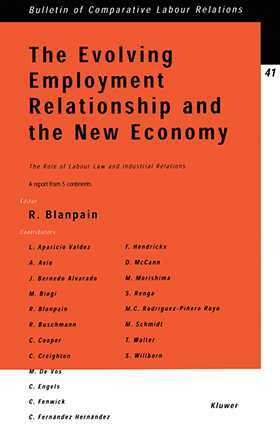 It was to further this purpose that the Club of Labour Law Journals held a conference in Brussels in April 2001, under the auspices of the Royal Flemish Academy of Belgium and the Society for Social and International Cooperation. This book is the record of that significant conference. the "battle for the brains"
Important questions addressed include: Do globalisation and high technology necessarily go hand in hand? Which skills increase employability? What are the social factors of employability? Are contingent and partly dependent workers protected in a fair way? To what degree can the employment contract be stabilized? How can we tackle the erosion of social security provisions? To what extent should intra-company electronic resources be regulated? What is the relation between employers and illegal immigrants? Participants include representatives from Belgium, Germany, Italy, Spain, the United Kingdom, Australia, Japan, South Africa, Latin America, and the United States.